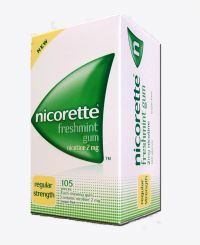 Wal-Mart is giving away free starter packs of Nicorette gum to help people quit smoking. The free gum comes in flavors white ice mint and cinnamon surge. The step-down therapy of controlled doses of nicotine is meant to ease withdrawal of smoking from cigarettes and increase a smoker's chance of quitting and staying smoke-free for six months or longer. To get the freebie you must be 18 or older and watch a short video on how Nicorette works.